The Palestinian political arena is currently moving toward the "politicization" of Islamic groups like Hamas and Islamic Jihad, whose impact on the July 2005 Palestinian legislative elections is yet to be measured. However, if Israel continues to undermine the prospects for peace by dictating a solution to the Palestinians through settlement expansion, the strangulation of the Palestinian economy, and unilateral actions—rather than engaging them directly—there will instead be an "Islamization" of the Palestinian politics, argued Hanan Ashrawi, a member of the Palestinian Legislative Council. Speaking at a 11 April 2005 briefing at the DC-based Palestine Center, Ashrawi urged the United States to adopt a policy shift in its dealing with Israel. "U.S. standing, influence, and credibility in the region has been undermined by Israel's behavior on the ground," Ashrawi said. "It is in the interest of the U.S. to have a viable peace in the region." Ashrawi argued that only a viable peace can counter fundamentalism and violence. A solution to the Palestinian issue will bring stability to the region and rectify the damage done to the U.S. standing in the Middle East. "Palestinians expect the American president to develop a political backbone [so as] to tell Israel it has gone too far," Ashrawi said. Furthermore, the Palestinians look to a re-engaged U.S. administration that will put an end to Israel's unilateral actions and create an atmosphere for serious political negotiations. Such an approach by the United States is what Palestinian President Mahmoud Abbas needs in order to deal with the tough domestic challenges that are facing him. Abbas was elected on a platform of non-violence and a negotiated settlement. However, his ability to deliver a political solution has been undermined by Israel's unwillingness to work with him. "Abbas needs to be empowered by corresponding action from Israel and serious re-engagement by the U.S. administration," Ashrawi said. Instead, the Israeli government is "busy transforming Abbas into a scapegoat" as it did with the late Palestinian President Yasser Arafat. She pointed out that Israeli Prime Minister Ariel Sharon will use his unilateral disengagement from the Gaza Strip to secure a U.S. recommitment to his plan to expand settlements in the West Bank. Ashrawi pointed to Israel's decision to expand the settlement of Maale Adumim and the implementation of the E-1 plan which will link the settlement to Jerusalem. If implemented, E-1 would bisect the West Bank and completely destroy any chance for a viable Palestinian state. The United States wants Palestinians to "accept the demographic changes on the ground" and rather than addressing the threats facing the peace process it is focused on nation-building, said Ashrawi. The United States expects the Palestinians to deliver a prefect system of good governance before the U.S. engages in negotiations. "That is difficult under military occupation and when you have no political options," Ashrawi noted. Despite the difficulties, reform is a main component of Abbas' agenda. Reform, argued Ashrawi, will be determined according to Palestinian needs and priorities, not by Israeli and U.S. pressure. She added that several cases have been referred to the attorney general and that the reform movement is keen on implementing reform in accordance with the rule of law. Reform in the security apparatus has proven difficult for Abbas. Israel and the United States want to impose their definition of security reform while Palestinians want an independent judiciary to deliver due process. Abbas, on the other hand, must deal with centralized power bases, security chiefs who have loyal followers, and the young generation with militias. Ashrawi stressed the importance of dealing with security reform in a way that "ensures the well-being of the Palestinian political system as a whole." A crucial body in need of reform is Fateh, Abbas' political party. According to Ashrawi, Fateh lost much of its support because it adopted a failed peace process during the 1990s. Furthermore, as the party in power, Fateh is now blamed for all the ills that plague the Palestinian Authority. This has caused popular support to shift to Hamas and other Islamic groups. "Fateh needs to rapidly put its house in order to influence the outcome of the July elections," Ashrawi said. 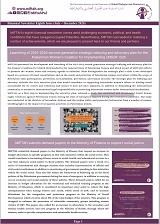 She noted that this may be difficult as Fateh is engulfed in an internal crisis because of a power struggle between the young and old guards of the Palestinian leadership, referring to the reform-minded younger generation raised under Israeli occupation versus those who were part of the PLO in exile who "superimpose the mentality of the occupation on nation-building." Ashrawi cautioned that if there are no positive developments toward peace and if Israel continues to act as an occupier, Fateh and the reformers will be further undermined. "The political map is shifting. Unless there is a serious change and a contribution to nation-building that will empower moderates, we will move toward the Islamization of Palestinian politics," Ashrawi warned. 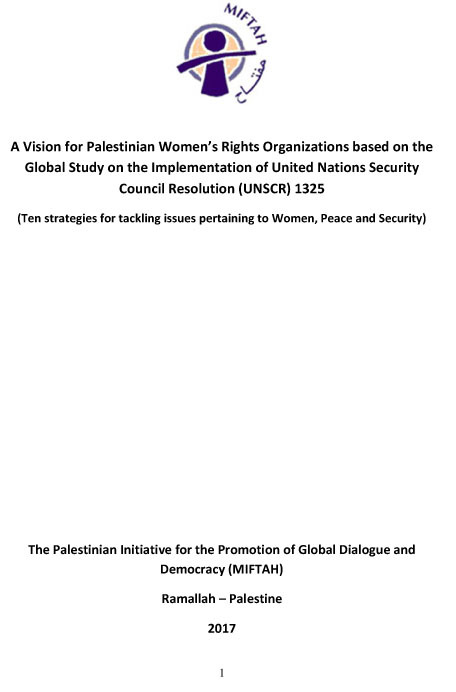 The above text is based on remarks delivered on 11 April 2005 by Dr. Hanan Ashrawi, an elected member of the Palestinian Legislative Council and Secretary General of MIFTAH, the Jerusalem-based Palestinian Initiative for the Promotion of Global Dialogue & Democracy. The speaker's views do not necessarily reflect those of The Jerusalem Fund or its educational arm, the Palestine Center. This "For the Record" may be used with out permission but with proper attribution to the Palestine Center.